Of the many wooden cigar factories which once dotted Tampa's Ybor City in the late 19th century and early 20th century, only one remains in the neighborhood. It stands on the southwest corner of Palm Avenue and 19th Street, a three-story building where workers rolled cigars and stored tobacco, and where Cuban freedom fighter Jose Marti addressed cigar markers during one of his visits from Cuba in the 1890s. Developer Ariel Quintela, who has overseen a number of renovation projects in Ybor City, has completed a restoration of the former cigar factory. The building is now home to 38 studio, one-bedroom, and two-bedroom apartments. It's also been renamed to honor the late Angel Oliva Sr. The Oliva Tobacco Company used the building for half a century and is still going strong on North Armenia Avenue in West Tampa. Quintela and his investment partner Darryl Shaw started work on the project in 2014. 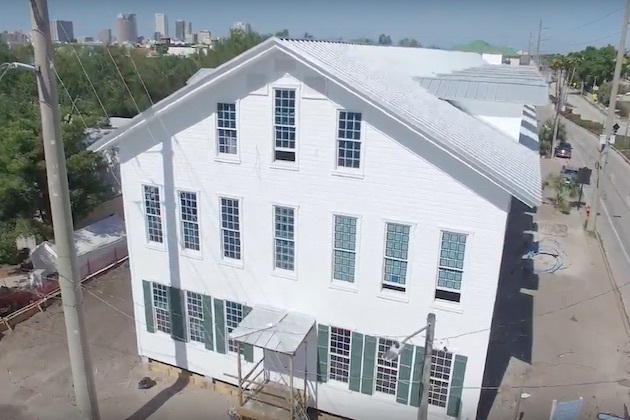 Along the way, they used a $250,000 grant from Hillsborough County's Historic Preservation Challenge Grant, a program encouraging developers to find modern uses for historic structures. The money was used to put in materials like windows, siding, and doors. "These old buildings are expensive to renovate," Quintela told Hillsborough County's official website. "But they're part of the fabric of Ybor City, and you just can't let them go to waste." Among the challenges of restoration was fixing a tilt in the building. It was leaning more than a foot towards the north. Once that was corrected, Quintela and his team sought to make the building as historically accurate as they could. They found the original front door and restored it. They built all-new moldings and shutters, rehabbed the balustrades on the first-floor staircase and made replicas of the others, and used as many of the original hardwood floorboards as they could (the rest came from a demolished church in Tennessee). The crew even replicated the original baseboards. "We wanted to use as much (of) the actual material of the building as we could," Quintela told the Tampa Bay Times. When we couldn’t, we made it look real. Why not go the extra mile?" The apartments range from 600 to 1200 square feet, and they feature 14-foot ceilings, wooden beams, and brick supports. Units in the Angel Oliva Sr. Apartments are expected to be available later this summer for renters who want to live in a piece of Tampa and Ybor City's rich history. Looking for more news on Tampa real estate? Or are you looking for places to eat and places to drink in Ybor City? Either way, 813area has you covered. Don't forget to sign up for email updates... they're free! Photo from Hillsborough County's promotional video on YouTube.